Description : The name of the genus is derived from Greek word chloros, ‘green’, phyton, ‘a plant’. The mature leaves hang down over the pot or container and long arching stem with the baby plantlets at the end will flow gracefully above and around the grass-like foliage. They are interesting as they produce long, drooping flower stalks ending in a tuft of leaves forming an offset. The genus has 60 or more species in tropical Asia, Africa and America. Grow Clean Air Benefits: These have been tested and said to reduce air pollution significantly and removes the following Volatile Organic Compounds( VOC's) Formaldehyde, Xylene and toluene. COMMON NAME: CHLOROPHYTUM WHITE GREEN. 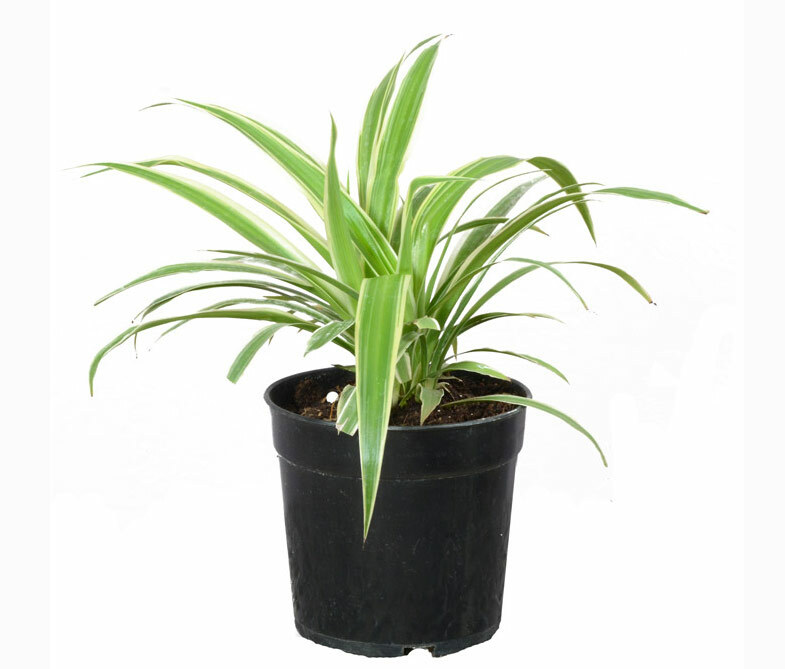 BOTANICAL NAME: CHLOROPHYTUM COMOSUM ‘MILKY WAY’. Leaves broad-linear, cream-white and green edging.